Dewi, Kurniawati Hastuti 2019. The Palgrave Handbook of Women’s Political Rights. p. 317. Lam, Theodora and Yeoh, Brenda S. A. 2019. Parental migration and disruptions in everyday life: reactions of left-behind children in Southeast Asia. Journal of Ethnic and Migration Studies, p. 1. Chin, Grace V. S. and Mohd Daud, Kathrina 2018. The Southeast Asian Woman Writes Back. Vol. 6, Issue. , p. 1. Abdullah, Najwa and Mohamed Osman, Mohamed Nawab 2018. Islamisation in the Indonesian media spaces new sites for a conservative push. Journal of Religious and Political Practice, Vol. 4, Issue. 3, p. 214. Hillman, Ben 2018. The Limits of Gender Quotas: Women’s Parliamentary Representation in Indonesia. Journal of Contemporary Asia, Vol. 48, Issue. 2, p. 322. Spagnoletti, Belinda Rina Marie Bennett, Linda Rae Kermode, Michelle and Wilopo, Siswanto Agus 2018. Moralising Rhetoric and Imperfect Realities: Breastfeeding Promotions and the Experiences of Recently Delivered Mothers in Urban Yogyakarta, Indonesia. Asian Studies Review, Vol. 42, Issue. 1, p. 17. Choi, Nankyung 2018. Women’s political pathways in Southeast Asia. International Feminist Journal of Politics, p. 1. Jakimow, Tanya 2018. Beyond ‘State Ibuism’: Empowerment Effects in State-led Development in Indonesia. Development and Change, Vol. 49, Issue. 5, p. 1143. Chin, Grace V. S. 2018. The Southeast Asian Woman Writes Back. Vol. 6, Issue. , p. 89. Platt, Maria 2018. Migration, Moralities and Moratoriums: Female Labour Migrants and the Tensions of Protectionism in Indonesia. Asian Studies Review, Vol. 42, Issue. 1, p. 89. Martin-Anatias, Nelly 2018. On Being a “Good” Indonesian Muslim Woman: An Autoethnography. Humanity & Society, p. 016059761881487. Mutaqin, Zezen Zaenal 2018. Culture, Islamic feminism, and the quest for legal reform in Indonesia. Asian Journal of Women's Studies, Vol. 24, Issue. 4, p. 423. Khoo, Choon Yen and Yeoh, Brenda S.A. 2018. The Entanglements of Migration and Marriage: Negotiating Mobility Projects among Young Indonesian Women from Migrant-sending Villages. Journal of Intercultural Studies, Vol. 39, Issue. 6, p. 704. Downes, Meghan 2018. The Southeast Asian Woman Writes Back. Vol. 6, Issue. , p. 107. Dewi, Kurniawati Hastuti 2017. Piety and Sexuality in a Public Sphere: Experiences of Javanese Muslim Women’s Political Leadership. Asian Journal of Women's Studies, Vol. 23, Issue. 3, p. 340. Chao, En-Chieh 2017. Entangled Pieties. p. 1. Pohlman, Annie 2017. The spectre of Communist women, sexual violence and citizenship in Indonesia. Sexualities, Vol. 20, Issue. 1-2, p. 196. Arimbi, Diah Ariani 2017. Women, Religion, and the Gift. Vol. 17, Issue. , p. 21. Warin, Jo and Adriany, Vina 2017. Gender flexible pedagogy in early childhood education. Journal of Gender Studies, Vol. 26, Issue. 4, p. 375. 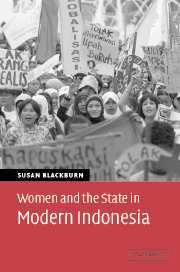 In the first study of the kind, Susan Blackburn examines how Indonesian women have engaged with the state since they began to organise a century ago. Voices from the women's movement resound in these pages, posing demands such as education for girls and reform of marriage laws. The state, for its part, is shown attempting to control women. The book investigates the outcomes of these mutual claims and the power of the state and the women's movement in improving women's lives. It also questions the effects on women of recent changes to the state, such as Indonesia's transition to democracy and the election of its first female president. The wider context is important. On some issues, like reproductive health, international institutions have been influential and as the largest Islamic society in the world, Indonesia offers special insights into the role of religion in shaping relations between women and the state.